Doors open at 5PM and the show begins at 7PM on both Thursday, May 26th and Friday, May 27th at the New City Brewery, 180 Pleasant Street in Easthampton. Visit https://millpond.live for more information. On May 26th, the spirit of New Orleans will blow in from the south and take the Valley by storm. 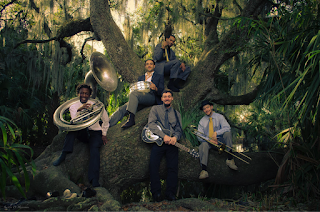 If you’ve ever set foot on Frenchman Street after dark, you know what I’m talking about; that foot-stomping, hip-shaking, musical vitality that seems to emanate from the cobblestone streets of the Crescent City. Help us welcome the Swamp Donkeys to the fertile banks of the Connecticut River, just beyond the bend, in the Big Easthampton. Join us for two evenings of utter exuberance at the New City Brewery, where we’ll revel in traditional jazz, Creole gumbo, and the Brewmaster’s finest handcrafted libations (ginger-mint julep, anyone?). The Swamp Donkeys channel hot jazz from the Dixieland era, which was better know as “Jass” in the speakeasies of the 1920’s. The all-star cast demonstrates deep reverence for the forms and sounds of the era while bringing youthful energy and modern sensibilities to their repertoire. The band is led by James Williams, who evokes the great Satchmo in his vocal styling, backed by the polyphonic sounds of the tuba, trombone, trumpet and banjo. The Donkeys recently won the Battle of the Bands at the 2016 French Quarter Fest (video here), adding to the list of prominent performances that have earned them international acclaim over the last year: Megève Jazz Festival, Monte Carlo Sporting Summer Fest, Red Cross Gala of Monaco, Edinburgh Jazz & Blues Festival, North Sea Jazz Festival, New Orleans Jazz & Heritage Festival, Ascona Jazz Festival, Vitoria-Gasteiz Jazz Festival, Ronnie Scott’s, The Blue Note, The Hamilton, Ginny’s, BB King’s, Cliff Bell’s, dba, The Spotted Cat, Howlin’ Wolf, The Red Rooster, and The Cutting Room.